Apparently, a movement is gaining steam in the OCA to restore Metropolitan Jonah as evidenced by this video recently released on Youtube. To what position he should be restored isn’t made clear but presumably it is Metropolitan of the OCA. This is an internal matter to the OCA of course and you can read more details on the Monomakhos blog. As before, I will not discuss the details about the OCA imbroglio here apart from those that impact the larger American Orthodox Church. My immediate concern is the public slander Met. Jonah has had to endure, as well the shortsightedness towards his many gifts, particularly his ability to present the Orthodox faith to a larger American audience. I outlined these points in an essay I wrote a few weeks back. Unfortunately, I have seen good men slandered before as a way to justify bad administrative decisions from higher-ups. I will not sit silent when that happens. What I find encouraging about the video is that the laity is finding its voice. We have good priests and good bishops in the Orthodox Church. In theory bishops are accountable to each other, in practice sometimes this breaks down. In those cases the laity has to speak up. Video removed. After numerous (and thoughtful) complaints and crticisms, I decided to close the thread and remove the video. I’m not in the OCA and don’t want to see the Observer become a forum for the internal OCA fight, and clearly I misjudged the meaning of the video. Goes to show I guess that we should let our neighbors do their own laundry! I’ll leave the thread up by way of explanation but discussion is closed. “All the laity”… isn’t that a stretch? Showing pictures of Archbishop Dimitri is hardly an argument for the case that this video purports to make. This smacks of agitprop, and not effective agitprop. Sorry, Fr. Hans, but this is not up to AOI standards. Another problem here: how do we know this was really produced by ‘laity’? There are plenty of talented clergy who could edit graphics and put this together. I looked at the YouTube Channel this was posted on, apparently devoted to a pool and attic equipment company. However, ‘all the laity’ did not identify the names of any laity that I saw, and it looks almost anonymous. I wonder who all was party to its inception and production? Perhaps Fr. Hans could post more information about this video’s origins. Agreeing with Fr. George here. This ‘lay woman’ does not agree with returning Met. Jonah to the seat, especially since he wants to return the OCA autocephaly to the MP, contrary to his backtracking statements. Is he a good man? Yes. Is he a leader when it comes to his monastery? Yes. But is he the type to take the OCA to another level. No, I do not believe so. Not to mention the precarious legal position he placed the OCA by his lack of following SMPACs recommendations. Having witnessed this type of thing before, this video and its backers is divisive which is wrong. Regarding the above notion that +JP has an agenda to ‘return of the autocephaly of the OCA to the MP’. I suppose because I liked his public speeches, perhaps I over-discounted the evidence along those lines. Now I wonder whether that’s true he was looking to sell out the OCA. I wonder this because those ‘swinging hardest’ to get him back in office make apologies for some really Gonzo stuff the Russian church has done in high places lately. Too, there is this odd reluctance among them to call it like it is relative to the Vatican’s clergy misdoing as well. The one thing the OCA has, owing to its actual self-governance (autocephaly) is the ability to attract folk who want to be Orthodox but who don’t think control by bishops across oceans is likely to lead to growth. To have the OCA not decide its own course would lead to fewer Orthodox folk, and on that basis alone the OCA should continue to manage their own affairs. There is the concern that there’s a lot of ‘strange activity in high places’ in the OCA. From the reports there’s enough ‘smoke’ to think properly there’s also some ‘real fire’ about that. Well, they’ll either correct it or whither I think, since what’s the phrase? ‘God will not be mocked’? Harry, you, Philippa and others are wrong about “returning the OCA to Russia.” That never was HB’s intention. To believe otherwise is ludicrous. For one thing, you’d have to ignore his first trip to Moscow as Metropolitan where he was awarded “full patriarchal” attention. Here’s a newsflash for all who believe this nonsense: Moscow has never had ANY intention of rescinding the tomos of autocephaly. They know who would wait in the wings. The Russians aren’t stupid. This of course does not guarantee that the OCA won’t self-destruct because of its leadershiop in Syosset. That may very well happen. Regardless, it’s impossible to lay the blame for this self-destruction at Moscow’s feet. Get over it. The ROC is the best friend the American autocephalists ever had. Fr. Hans, I agree that it is nice to see the laity involved and say bravo however, with that said, I am little confused about the video. Making bold statements like all of the OCA laity, that is not a statement that should ever be made because it is not true, as the above comment shows. I am also confused by the inclusion of the photo of Archbishop Dmitri of Blessed Memory. I should have said upfront that I am not a priest of the OCA and like you, I have refrained from comments regarding the inner working of another jurisdiction unless it affect the whole Church. I just find the entire thing very confusing unless I am missing the point. Perhaps the person who made it could comment here and shed some light on it for us so we can better understand their thinking. I continue to pray for the Holy Synod of the OCA, the clergy and the lay people. You are correct that these events affect the entire church and not just the OCA. This type of messaging was part of what I studied as an undergrad in the 1980s. “Agitational propaganda” was developed by the Soviets to deliver a simple message in a minimalist fashion. This movie does that: few words, emotional music, a montage of images which the viewer is expected to knit together to form a narrative, something like “Everyone loves Archbishop Dimitri, and Archbishop Dimitri loved Metropolitan Jonah, and so you must, too!” The truth is far more complex and nuanced, so this video follows the agitprop paradigm by oversimplifying the connections and amplifying the emotional values so that the viewer reacts rather than contemplates what’s missing. This is the ‘agitation’ side of the message… a call to action and something of an implied threat. Gustave le Bon also wrote about this type of messaging in “The Crowd,” where he described the process of forming a “mob mentality” that is as reactionary as it is irrational. Once the crowd has settled on a decision, it is irreversible. This is much the case with the agitators for Metropolitan Jonah’s return: they will hear nothing of His Beatitude’s own admissions or the evidence that there was a significant lack of leadership on his part. Writing speeches and appearing well before an audience… presidents Bill Clinton and Barack Obama do those very well. I’m sure Fr. Hans would disagree that they embody his vision of the American presidency. Metropolitan Jonah is, at his core, a sincere believer. And, he is, as most of us, a complicated person that such a video purposefully tries to obscure with an over-simplified message. That’s agitprop. The only thing worse than “agitational propaganda” is an uncanonical removal of a Metropolitan. And while I felt odd after watching the video, “someone” expressing themselves on YouTube is normal and welcomed. I don’t know if Jonah+ wanted to return the OCA’s autocephaly, or if he he could unilaterally do that or not. But I do know that there is a ‘culture war’ going on in the Orthodox Church of sorts. And unfortunately, regional Churches are fighting over who is ‘number one’ – perhaps this has something to do with our idolization of culture? Be careful about tossing around “uncanonical removal of a Metropolitan”. Remember that Metropolitan Jonah signed a letter. If you say that he was forced to sign the letter and did so, then he would be guilty of violating his consecration oath to do nothing under constraint or by force. The Orthodox Church has chosen bishops from among the monastics precisely to avoid threats to families as a means by which a bishop could be manipulated. In fact, the bishop swears a sacred oath not to be compelled to do anything against his determination of what is good for the Church. Ergo, if his resignation was bad, and he was forced, then he is no longer canonically qualified to be a bishop and should be returned to the rank of monastics. I am not advocating this, but I am pointing out that your argument leads down that road. You might want to pick another line of reasoning if you really want to see Metropolitan Jonah back in ministry. With all do respect, Father. I think I have worse things to worry about. But, I do know what I’ve read, seen, heard, and grown up with in my life. I’m no theologian, or even a good Orthodox Christian. But I’ve grown up in the Church. And as much I love converts to the Orthodox Church, they still may be a bit naive as to what our ‘old guard’ is capable of. I know exactly what they are capable of. Luckily for us, this is no way diminishes the Truth in faith and practice of One, Holy, Universal, and Apostolic Church. My labeling of the Metropolitan’s removal as uncanoncial is not what the problem is. If there is any sort of manipulative rhetoric than this would be it. I appreciate your sincerity and experience, but what I am speaking of is not ‘convert enthusiasm.’ The canons of the Church are clear: a bishop cannot be forced to do anything, and if he is, then he is to be deposed. You should worry about re-installing a bishop who collapses under pressure. That should be huge worry. This is a nice twist on things. We shouldn’t be ordaining women as Readers as well – but parishes in the GOA have done so. I don’t believe this is a ‘twist’ but a perspective. I have a perspective, you have yours. All I am trying to do is explain my perspective in a reasonable way. What happens in the GOA is an entirely different matter. Right now, we are talking about what’s going on in the OCA and this video. Fr George, your obeisance to the canons is admirable, but it smacks to me of what my orthodox Catholic friends call “cafeteria Cathollicism.” If you are honest with yourself, you would know that the canons here in America (and in the OCA) are for all practical purposes legal fictions and nothing more. Therefore, I had to address the canons. If people want to stop accusing the Holy Synod of violating the canons, I would be more than happy to stop pointing out how their arguments actually violate the canons and make Metropolitan Jonah look far worse than he deserves to be portrayed. Sometimes, I think His Beatitude’s worst enemies are his loudest supporters. Then what do you do to those who force a Bishop to resign? Especially if the force were applied by other bishops? Frankly, the one bishop affected most has not made such a charge, so… well, nothing really. I say it’s an interesting twist because the backdrop behind the reasoning for his “forced ouster” (or whatever) was that he was too aggressive and angry, and that this lead to his lack of administrative control. Now, I hear you suggest that he collapses under pressure. I wish folks would make up their minds. He ouster was either forced, or not. Fired, or retired. Angry or passive. Canonical or uncanonical. Etc. In the meantime, economia is used selectively, and so is Church status. Mind you not based on any sort of Law – Spirit or Letter. Rather, based on ethnic chauvinism and power maneuvering. No, MR, you suggested he collapse under pressure… did the Holy Synod force him to resign or not? If they did, then he had to give way, unless you are suggesting that he did not sign the letter? Ditto for “collapse”. So, I can see why macedonianreader was under the impression that you said that. Lola, Fr. George is right. I did suggest it. However, I have always been under the impression that Met. Jonah+ accepted the “resignation” out of humility not weakness. I could be wrong. Humility is always about truth. The most humble thing is to say the truth. Lies are always vanity. I would never dare question His Beatitude’s sincerity in writing his resignation, and I think that people may be disappointed with that decision, but it was his to make and he made it without force. Therefore, I believe he preserved his integrity. To believe that he caved to pressure is to question his integrity. Lack of integrity is not humility. It is cowardice. I do not believe Metropolitan Jonah acted as a coward. We can and should always show mercy, but not at someone else’s expense. So, if you follow the argument that the entire OCA is endangered by the actions of the Holy Synod, then showing mercy would be to stand up to them and not resign. That would be the act of mercy: to sacrifice one’s sense of peace for the good of the Church. However, if the matter is strictly between the Holy Synod and His Beatitude, then, yes, the most merciful thing to do would be to resign. Being merciful does not mean letting a criminal go to heap more condemnation upon himself and sin against more people. This is why the canons always dispense a chastisement for sins, though such punishments are far less than what really ought to be meted out. I think we need to have mercy on both His Beatitude and the Holy Synod: let them work things out amongst themselves and stop trying to swing the game one way or the other. Fr. George. I think you’ve swayed me on this one. I’m bowing out now. As a catechumen in an OCA church, I’ve had to consider my decision to be baptized and chrismated after 22 years as a hard-studying Protestant. I was raised to distrust clergy who were put in positions of great power over the spiritual lives of laypeople. And although I have gained an appreciation of the true intention of the apostles in providing for a formal clergy, beginning with the bishopric, I was confronted with this high-level fallout at the same time our parish priest was unceremoniously removed from his position without explanation. While I understand the reasons for not disclosing the full situation, I saw how devastating it was for many long-time members who suddenly lost their confessor at the blink of an eye. This double-whammy of administrative control wielded by our particular Bishop (him being involved in both the removal of the priest and as part of the Met. Jonah situation) forced me back into my previous distrust of human power. The way I saw it, I had two decisions I could make for the spiritual well-being of my family: 1) Leave the OCA, and either continue looking for an Orthodox confession with a different administration, or just stay home (I could never go back to Protestantism again, knowing what I do now.) or, 2) Continue on where I am and not allow the bickering and questionable decisions from higher up to affect that which is most important – my personal growth in piety and prayer as I move in the direction of theosis. With the help of the great maturity I saw from the older members of our parish in dealing with the difficulties and upheaval from these situations, I have decided to choose the latter. Had it been otherwise, and the laity of our church dissolved into finger-pointing, distrust, and anger, I can’t say for sure that I would have made that decision. My main purpose in sharing this is to point out how easy it would be for a converting member to walk away from the OCA, and even the Orthodox faith entirely. I’m not convinced that many other Protestant converts wouldn’t have made a different decision than I did under the same circumstances. If Orthodoxy is going to gain a better foothold here in America, the leadership of the OCA really needs to understand how their actions, right or wrong, appear to those who already tend to shy away from traditional Christian confessions. Few Americans will be drawn to a beacon of light that appears to fry it’s own members where they stand. You’re absolutely correct. I apologize if my posts here have added to your aggravation. Let me assure you this is not endemic to Orthodoxy. I think if you get anything from the discourse between Fr. George and myself is that the issue revolves around lacl of transparency and the long-termed inability of OCA hirearch’s to handle any sort of administrative problem. While I don’t believe the laity can just willy-nilly reinstate a Hirearch with protests, videos, etc. since the Church just doesn’t work this way, I also do not believe clergy need be removed in the way you stated or the way Met. Jonah+ was. I also know that since the 4th Century there has been a fine line between how the canons have been used (or ignored) to that of nationalism in the Church and just plain corruption. Again, none of this has any bearing on the Truth and Practice of the One, Holy, Catholic and Apostolic Church. It does, however, remind us that clergy is needed. New clergy is needed, always. And the experiences and expertise brought in by our former-protestant brethren can prove to be invaluable for the Church’s future. This infamous book, Beasts in Cassocks, is a treasure-trove of laughs, yet at the time is was the ‘Monomakhos’ of Carpatho-Russian Orthodox-Catholic relations. The Greeks have had similar problems with Archbishop Spyridon years back, and there was a recent controversy in my own jurisdiction, the Antiochian Archdiocese. However, none of these events compare to the problems the Apostles faced, nor even the level of discord surrounding the Arian or Nestorian controversies. Second, you also have to look to the rest of the Churches for their reaction, which has been largely silence. If the OCA really had a canonical problem in how the resignation took place, the rest of the Churches would comment. They aren’t. Even Moscow has chosen not to interfere. The convert has a choice: to listen to God or the devil. If you read the baptismal service, this is what the primary struggle of the Christian is. The devil is trying to sow chaos, but all this will end up doing is winnowing those who refuse to see the untouched theology of the Church in the midst of human weakness. Here we are, a bunch of people who don’t necessarily speak the same language or reason the same ways, yet we are united in One Faith. The situation with Metropolitan Jonah is sad from all sides of the matter, but it is far from a game-ender for all but those who are easily distracted. If the OCA really had a canonical problem in how the resignation took place, the rest of the Churches would comment. They aren’t. Following this logic, one would say that if someone was robbed in the street in an inner city ghetto and no bystander cared to interfere then no crime has been committed. The fact is, three of the Holy Canons have been violated: “The bishops of every nation must acknowledge him who is first among them and account him as their head, and do nothing of consequence without his consent…” (Canon 34 of the Holy Apostles.) “Therefore, if any, whether clergymen or monks, should be detected conspiring or banding together, or hatching plots against their bishops or fellow-clergy, they shall by all means be deposed from their own rank” (Canon 18 of Chalcedon). The same is reaffirmed by Canon 34 of Trullo. I believe all this applies to the situation when several of the bishops secretly meet without their Primate’s knowledge and decide to demand his resignation. One can add the slanderous letter released under the Holy Synod’s signature (see http://christinefevronia.blogspot.com/ for an in-depth analysis). One can add his removal from the office of the Archbishop of Washington from which he never resigned. One can also add listing him as “retired” on the OCA web site even though he did not retire. Fr. George has a good point, however, that Metropolitan Jonah should not have resigned under pressure. Yet, how many people would not yield in a such a situation when all his peers (as he was apparently incorrectly informed) demand resignation? And even when he signed a resignation letter in a moment of weakness, what right did the bishops have to accept it? The OCA statute does not provide for a resignation. Death, medical incapability, or retirement are the only acceptable reasons. Canonically, they should have denied a request for resignation. To comment on the opinion of the lay people, this lay man does want Metropolitan Jonah restored. He also knows scores of other lay people who want the same. This is confusing: are you saying that His Beatitude allowed his Holy Synod to violate the canons, and yet he took no action? This is an affront to His Beatitude’s intelligence (you noticed a conspiracy, but he did not) and strength. If you know, he knew. Yet, he is not making the accusation, you are. His Beatitide was not a bystander to the actions of the Holy Synod, but had a canonical duty to stop the Holy Synod members from such a conspiracy. Yet, he never uttered a word. I think this argument fails to shed light on the reality of the situation: His Beatitude took an action that was appropriate and canonical: if he was not canonically entitled to resign, then he should not have. Not true. This is what he uttered at Santa Fe before all this started, and was immediately silenced by Bishops shouting and pounding on the table, slamming doors, etc. In an effort to achieve conciliation, he demurred – he shouldn’t have – but he believed his “brothers” were just unruly and that he could find consensus…in other words, he underestimated the depth of the conspiracy out of love for them. This is worth a read to understand just who +JONAH is. Thank you for posting this article. His beatitude does indeed speak of a conspiracy, but he does not accuse members of the Holy Synod. And, he certainly never brought any charges against any of the hierarchs. Until he does so, claiming that the bishops of the Holy Synod engaged in a ‘conspiracy’ and violated the canons is not only irresponsible, but it makes His Beatitude look like an accomplice to his own demise. If he knew of a conspiracy, he should have, and would be duty bound in fact, to fight it for the good of the Church. If there was a conspiracy, then he let it win. I do not believe that there was a conspiracy, and that His Beatitude has never brought canonical accusations against any of the bishops is evidence that he did not think so either. If there was a conspiracy, he abandoned his post to it. I do not believe that His beatitude abandoned the OCA or his post, but realized that he could not carry out the leadership duties of being Metropolitan. This is not a judgement of his character, but rather an acknowledgement that he tried and it did not work out. So, he did the right thing and stepped down before things got worse. This was clearly the implication of his letter. I do not believe His Beatitude lied when he signed that letter. Frankly, I am not a little saddened by how many people are willing to portray His Beatitude as a weak prevaricator in the name of ‘defending’ him. Meeting of the bishops without the Metropolitan and without his knowledge IS conspiracy. There is no way around it. And it is a grave violation of the canons, one that carries a deposition from rank as a consequence. Note that I do not defend the Metropolitan’s action here – he should not have resigned despite all the pressure. Yet one violation of the canons does not justify another. His Beatitude took an action that was appropriate and canonical: if he was not canonically entitled to resign, then he should not have. Frankly, I fail to see any logic here. You are saying that if he did resign, this means that his resignation is canonical? This is the same as to say that if I did exceed the speed limit when driving this morning, then I acted in accordance with the law: if the law prohibited it, I should not have done so. Absurd. Historically speaking, a number of bishops have resigned. St. Theophan the Recluse and St. Gregory of Nyssa are two examples. It is not ‘uncanonical’ in the sense that, while it is not the canonical norm, bishops do resign and are not subsequently deposed. St. Vladimir’s Seminary plays host to Bishop Seraphim Sigrist, former of the Diocese of Sendai. He also resigned his post. The fact is that His Beatitude has never accused the bishops of the Holy Synod of ‘conspiracy,’ though he has the opportunity even until this point to do so. The fact that he has not means that he does not believe that they did so. However, if he had evidence that there was a violation of the canons and yet he took no action makes him a party to the sin. That would be absurd. If you’d like a legal example, it is an ‘Accessory after the fact’… he enabled the crime to escape justice. Unless you have evidence that His Beatitude actually believes such a violation took place, then you are second-guessing His Beatitude’s judgement by saying that there is a conspiracy when he has made no indication, as one closer to the events than you or I, that such a conspiracy took place. I really wish that those who seek to defend His Beatitude would stop assuming that he is some kind of weakling that cannot stand up for the truth and the good of the OCA. Father Hans said “My immediate concern is the public slander Met. Jonah has had to endure…” I also am concerned with public slander that has been expressed on Monomakhos; public slander of the Holy Synod as a whole, of various OCA bishops, and of other OCA officials. I am more than concerned, I am aghast at the open and hateful calls for schism that is expressed on that blog. Finally, I am surprised that the supporters of +Jonah do not seem to realize that their call for his restoration to active duty is in contradiction to +Jonah’s own words, to the effect that he is not fir to be a bishop. The excuse is being made that he was forced to confess his shortcomings to to resign. However, as Father George has pointed out above, that position exposes +Jonah to even greater canonical danger. Carl, take that up at Monomakhos. That’s an in-house fight. The slander against Met. Jonah spilled over into the mainstream press. With all due respect, you are the one who put Monomakhos on the table: “This is an internal matter to the OCA of course and you can read more details on the Monomakhos blog. As before, I will not discuss the details about the OCA imbroglio here apart from those that impact the larger American Orthodox Church.” You cannot have your cake and eat it too. Regarding taking it up at Monomakhos, I had been waging a somewhat lone battle for years but I had to finally give it up. George, et al, have made up their minds; they have their agenda; and they started to advocate schism. Regarding “the slander against Met. Jonah” that has spilled over to the mainstream press, I would think that the greater damage to +Jonah the person is done by his purported followers who excuse his words at the Santa Fe Retreat, the Seattle AAC and the resignation letter as having been the result of coercion or misunderstanding. There was no earthly reason for +Jonah to have broken his promise at Santa Fe and there is no excuse for having uttered or written any words that he did not believe in. Seriously, Abouna, this is over the top. To suggest that by this video, with absolutely no evidence of who produced it or from where it is sourced, might indicate “the laity is finding its voice,” is a fantasy quite uncharacteristic of you. Quite irrespective of the issue, is this what Orthodox “oratory” and the “public square” has become? That some creep(s) would fail to respect the final days of Archbishop Dimitri, his final Anointing with the Holy Unction before his passing, all in order to suggest an endorsement? As I noted in my reply to your original post, if we have reached a point in our “wandering in the desert” where the Orthodox Church in America should rise or fall on a single man – one who has described himself as “the least experienced of my brothers,” having neither “the personality nor the temperament” – then we are lost. And all the sappy commercials created for YouTube are for nothing. Time will tell. My hunch is that the old ways of doing business are over. The video is a poorly done animoto video. (www.animoto.com) The channel it is on belongs to Murray Smith, A member of St. Seraphim’s Parish Council and spokesman for the ABP Dmitri memorial chapel. 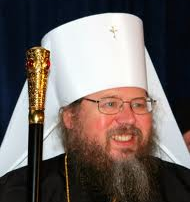 What in the blazes pictures of Archbishop Dmitri’s repose have to do with the insanity of the OCA Synod is beyond me. As a convert to the orthodox faith I am personally appalled at what I have seen and experienced within the OCA over the past few years. All things considered I’ll ride it out in another jurisdiction til these clowns finish shooting themselves in both feet. I am not alone, That’s the real tragedy here. Geez Murray pay 5 bucks and get the animoto logo off at least! Take care and be aware. Fr. Hans: “Apparently, a movement is gaining steam in the OCA to restore Metropolitan Jonah as evidenced by this video recently released on Youtube.” The video evidences nothing other than the fact that some individual compiled some photos and uploaded it to YouTube. I have it on good authority that a movement is gaining steam in the USA that Ralph Kramden and the moon are one in the same. Well, this is degenerating fast. I will let it roll one more day but might have to pull the plug. Well, I did say that I thought posting the video was beneath AOI standards. I’m surprised that you didn’t catch the problems with it, which are evident in the conversation. At its core, the video is not a reasoned effort, and so it will bring out that which is unreasonable in its defense or in its critique. To be honest, I have yet to see any published work on the situation within the OCA right now that does justice to all concerned. His Beatitude is a complex figure in an even more intricate situation. Because people want to settle for platitudes and simplistic, Alinskyite themes, there will be no progress. There are larger questions afoot, such as the obvious conflict between our Church tradition and how our bishops relate to the clergy and the people in the US. This is an enormous question, and yet few want to talk about it because the subject naturally moves toward change… and we all want someone else to change rather than ourselves. But, the problems we have been dealing with for decades here in America are now becoming issues throughout the Orthodox world. The canonical problems we are trying to deal with are popping up all over the globe. Yet, nobody wants to sit down and deal with them fairly. We can say nothing to popular secularism and militant atheism if our own house is not in order. An army divided against itself cannot march against the enemy. This video is just another example of “Pick the target, freeze it, personalize it, and polarize it.” You know who gave us that. The Orthodox should not be treated like The Crowd. Although I was trying to make a point in a videographic way, I agree completely with Fr. George. AOI needs to maintain the high standards for which it has been and is known. Truth is, the OCA is done. Time to pack up and find a real Orthodox Church. George: Question: Have you met Jonah and talked to him and, if so, on how many occasions and for how long? I find all of this very interesting and wonder how many of the folks above were born into Orthodox families as I was. With respect to autocephaly, I wonder how many of you recall the fact that all Orthodox juristrictions were once under the MP. Patriarch Tikhon when he was the MP exrach to North America was the presiding bishop over All Orthodox bishops in North America. St. Raphael served under him! It was the dissintegration of the politcal situation in Russia and then the Soviet Union that changed this. Given the utter mess that is the current hierarchy of the OCA, returning to the MP would be the best thing for the OCA. Met. Jonah should not return to the place of primacy within the OCA. His questionable management skills and questions concerning his relationship with certain diposed ROCOR priests should preclude him from being re-instated. Both the ROCOR and OCA have run their respective courses. It is time that the Orthodox Church — all juristrictions — return to their Mother Church; namely, the MP. I said I’d bow out – but I have to reply to this. Let me state. Fr. George has a very compelling line of thinking and I follow. But why should the OCA give up a “status”? Because hypothetical – Bishop “so and so of the Former Yugoslavia” knows how to run an office better then Met. Jonah+? Serious? Really? We could tow the party line, OR we could go with the line of thinking that Church status like autocephaly and autonomy are pretty arbitrary qualifiers, set up fairly recently in our Church’s history, more so as a hegemonistic means for so-called “mother” Churches than to be pastoral. In reality, all regional Orthodox Churches should be simultaneously autocephalous and autonomous by definition since we are simultaneously individuals and part of a community. These ‘labels’ shouldn’t be used to stigmatize a particular regional Church or as a means for a “mother” Church to hang it over the head of Orthodoxy. If a particular Church has “problems” the way we get over these problems (including schism) is through co-celebration of the Divine Liturgy. We learn to overcome our short falls by watching each other, by following each, and by listening to each other. If anyone has any particular lead it would be our Monk-elders/elderesses. This is why I hear a “return to the mother church” speech my eyes glaze over. Politics, Church names, Bishop temperament, or lack of office skills are absolutely not, ecclesiastically, reason enough to throw an entire regional Church in disarray. Nor is it an excuse for “mother Churches” to maneuver for power. You and I are not that far apart on this issue. Frankly, I believe that talk about the ‘Mother Land’ largely has to do with the demographic disasters in Orthodox homelands rather and any real understanding of the local issues in America. There is a profound problem overseas with both emigration and plunging birthrates. The churches look to see where their people are going, and are hoping to keep them ‘in the church’ so to speak. The problem is that for every immigrant we receive here, we are also receiving 2-3 non-immigrants either through direct conversion, birth, or intermarriage. So, we are definitely becoming an indigenous church here that most of the overseas hierarchs actually have very little interest in. Frankly, I have seen lousy ‘American-born’ bishops, and I have seen good ones as well. Same is true of foreign-born. What makes them good or bad has largely to do with their love for the people and ability set up functional administrative structures. Lacking in either category means disaster. How do we, however, get the bishops overseas to see us differently? I think by visiting them, and getting them to visit us. Invite some of the hierarchs from, let’s say, lesser-known diocese in the Old Country and give them a tour. Show them our struggles. Let them meet the people. We should visit them as well. Right now, it is the immigrants/emigrants who get to create the narrative. We could change that. I remember years ago a bishop from Lebanon came for a visit. Our bishop present our deanery to him, and he was utterly shocked that he needed a translator to be understood by us. You could see that he had not a clue as to what the American Church is like. We could also help our overseas brethren with their struggles. They are fighting secularism, consumerism, and invasive protestant evangelization that they are not armed to deal with. These are our daily issues here in the US and Canada. We could show them what we have learned. These are the projects I have tried to involve myself in. I believe that we are part of the same One Body in Christ, and so we need to work together. I think that if we do so, God will bless us. However, He will not bless us if we take an adversarial position or take on the ‘victim mentality.’ We must struggle as Christians do, with love for everyone and a desire to minister. I had those thoughts once in the GOA. It is rather difficult to help a person from the perspective of looking up at their shoe on your neck. If there was a long scrolling list of hundreds of names at the end, it would have been different. Would that constitute ‘all the laity’? Ha! No. I won’t pile on, I agree it was a good choice to not show it further.